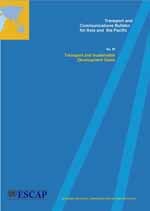 The Transport and Communications Bulletin for Asia and the Pacific is a peer-reviewed journal published once a year by the Transport Division (TD) of the United Nations Economic and Social Commission for Asia and the Pacific (ESCAP). The main objectives of the Bulletin are to provide a medium for the sharing of knowledge, experience, ideas, policy options and information on the development of transport infrastructure and services in the Asia-Pacific region; to stimulate policy-oriented research; and to increase awareness of transport policy issues and responses. Managing the transport sector can make a direct and indirect contribution towards the achievements of the Sustainable Development Goals (SDGs) if the three pillars of sustainable development – economic, social and environmental – are integrated into transport policies, planning and operation. More specifically transport policies, initiatives and projects can contribute towards achievement of the SDGs. The current issue focuses on the theme of “Transport and the Sustainable Development Goals (SDGs)”. Each of the five papers considers different interesting aspects of the subject. Article 5. A sustainable urban transport initiative in Dhaka: Introducing bus rapid transit system by Ishtiaque Ahmed, Noor-E-Alam and Faizuna Warda.